Read reviews: SIGNews, History: Reviews of New Books. Harry G. Lang, a leading deaf historian, has taken on the monumental task of writing the definitive biography of Edmund Booth, one of the most important deaf figures in nineteenth-century America, perhaps second only to Laurent Clerc. 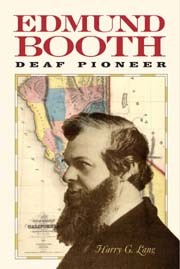 Edmund Booth: Deaf Pioneer is a successful and engrossing read. The few readers already familiar with Edmund Booth’s California Gold Rush journals and letters, which were published in 1953, need not fear that they will learn nothing new. Lang has delved deep into Booth’s life before, during and after his California adventures, so the book is a complete story of Booth’s whole life. When the Booth family learned of the deaf school just across the state border into Connecticut, Booth was sent there. Booth proved to be a brilliant student, studying under Laurent Clerc among other pioneering teachers. Then he was invited to join the faculty. Booth taught Mary Ann Walworth, whom he later courted and married. As much as he loved teaching and the intellectual milieu he participated in, Booth was restless. The uneasiness manifested itself when Booth and other deaf teachers protested their salaries, which were lower than the hearing teachers’. Deciding to go to what was still the Iowa Territory, Booth left the East in 1838 to try his hand in the frontier. After doing odd jobs, Edmund and Mary Ann got married in an interesting ceremony. The justice had never performed a marriage and was clueless. Booth saved the ceremony by showing him a newspaper account of the recent royal wedding of Queen Victoria and Prince Albert. The justice agreed to use the pronouncements quoted in the account, pointed to the passages while the couple nodded and they were married. Booth didn’t enjoy farming. For two terms, he found some intellectual stimulation serving the first Iowa legislatures as secretary. The Booths’ frame house was the first in the town of Anamosa, a name which Booth suggested to the government when the old name was rejected because it was too common. Mary Ann gave birth to two children. Despite all of this, Booth grew restless again. Then gold was found in California. Booth left for California in 1849. Upon his arrival there, he learned that the miner’s life was a hard one and only a few got rich fast. So Booth set a reasonable goal of working until he earned 3,000 to 4,000 dollars. Mary Ann, however, was unhappy living with her hearing relatives in Iowa and begged Booth to return soon. Five years later, Mary Ann fell ill and Edmund Booth finally realized he had been away long enough and came home. He was still not satisfied with the farming life after his homecoming. But a newspaper was set up in Anamosa and Booth started to write for it, later buying an interest in the business. In a few years, Booth bought all of the shares and became the first successful deaf publisher of a mainstream publication in America. For many years thereafter, the Anamosa Eureka was the official newspaper of Jones County. From the first, Booth was a fervent abolitionist and was known among Union soldiers during Civil War as “Friend Booth.” His work was so appreciated that many declared his work with the pen equaled the work of generals. Booth was also the first Iowa editor to openly advocate universal suffrage for women. Booth’s place in the mainstream history of Iowa is remarkable enough, but Booth also loomed large in the deaf world. All his life, Booth maintained connections with other deaf people. Whenever he learned of new families with deaf members moving in the region, Booth would travel and establish friendships. He pushed for the founding of deaf schools. Booth was a pivotal party in the debate over the Commonwealth of the Deaf in the late 1850s. In 1880, when the National Association of the Deaf had its first convention, Booth was voted the convention’s chair and later nominated for president, a honor which Booth graciously declined, citing his wish that a younger person have the honor. Edmund Booth: Deaf Pioneer is a superlative biography not only because it was written by a fine historian, but it also receives loving care in the hands of a deaf historian. Lang masterfully weaves the words of his subject with a narrative that does not obscure the people it is about, but urges them forward to tell their stories themselves with Lang serving as master of ceremonies. He also lingers here and there in admiration of the hallmarks of nineteenth–century American history, all of which bear the handprint of an unforgettable giant. Harry G. Lang is Professor in the Department of Research at the National Technical Institute for the Deaf in Rochester, NY.